You have leased your oil and gas rights, but they have not been pooled, and nothing has happened on your property during the primary term¹ of your lease to develop the oil and gas. You have leased your oil and gas rights and the land containing the oil and gas has been pooled with other lands to create a unit, but nothing has happened to develop the oil and gas in the unit during the primary term. In either case, at the end of the primary term of your lease, does your lease terminate? Is it at an end? Not necessarily. Where your royalty is based on volume of production and your lease is for a period of years and “as much longer as oil and gas is produced,” or similar language is contained in your lease, your lease may not automatically expire at the end of its primary term. Under Pennsylvania law, oil and gas lease agreements must contain a termination provision in order to terminate automatically. Girolami v. Peoples Natural Gas Co., 365 Pa. 455, 76 A.2d 375, 378 (1950). (“The lease in suit contains no provision for its automatic termination in the event of the failure of the lessee to drill or to pay the delay rental, nor any express reservation of the power of forfeiture.”) See also Smith v. Peoples Natural Gas Co., 257 Pa. 396, 101 A. 739 (1917) (“The usual rule is that a lease must state the condition upon which a forfeiture can be declared or no forfeiture can be declared”); Thompson v. Christie, 138 Pa. 230, 20 A. 934 (1890) (the right to declare a forfeiture must be distinctly reserved and the proof of the happening of the event must be clear and the right exercised promptly and the result not unconscionable); Marshall v. Forest Oil Co., 198 Pa 83, 47 A. 927 (1901) (“There is nothing in the lease providing that it should be forfeited by the nonpayment of the rental”). If your lease contains no such provision, if there is no automatic forfeiture clause, upon the cessation or expiration of the primary term, your oil and gas lease will not automatically terminate if your compensation as lessor depends upon the volume of production and the lease term is for a period of years and “as much longer as oil and gas is produced” or similar language. 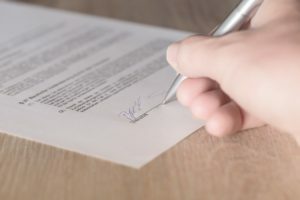 When oil and gas is no longer being produced, the lease becomes a tenancy at-will and the tenancy may be continued by mutual consent or it can be terminated by either party upon notice being given. Cassell v. Carothers, 193 Pa. 359, 44 A. 446 (1899). White v. Young, 409 Pa. 562, 186 A.2d 919 (1963). See also Clark v. Wright, 311 Pa. 69, 166 A.775 (1933); Derrickheim Co. v. Brown, 305 Pa. Super 173, 451 A.2d 477, 480 (1982). Adopting a rule, then, that will do equity to both parties, we hold that in an oil lease for a fixed period, and “as long thereafter as oil is found in paying quantities,” where the lessor’s compensation is one-eighth of the oil produced, the tenancy as to the surface of the land, after the expiration of the fixed period, and after the fact that oil is not being found and produced in paying quantities becomes susceptible of proof, is a tenancy in the nature of a tenancy at will, and, if not actually terminated by mutual consent, or continued by mutual consent, in order that further exploration be made, may be terminated by either party. In White, when neither oil nor gas was found in paying quantities nor royalties paid for over three years after expiration of a fixed ten-year period of the lease, Pennsylvania’s Supreme Court held that the lease must be treated as a tenancy at-will, terminable by either party, and the lessor’s notice in writing of intent to terminate lessee’s oil and gas rights terminated the tenancy at-will. White, 146 A.2d at 922. As indicated in Cassell and White, it is important to emphasize that there is a distinct difference between expiration of an oil and gas lease and termination where the lessor’s compensation depends on the volume of production. In such a case, where there is no longer any production, and the lease term is for a period of years and “as much longer as oil and gas is produced” or similar language, the oil and gas lease may have expired, but it does not terminate. Rather, the lease becomes an at-will lease subject to continuation by mutual consent or termination by either the lessor or lessee. Accordingly, where your royalty is a percentage of production, and not a fixed amount, and where your lease’s term is for a period of years and “as much longer as oil and gas is produced” or similar language is contained in your lease, even though your lease may have expired, it does not terminate. As such, the lessee of the oil and gas still has rights under the lease until such time as you take some action to terminate the lease; e.g., you give notice to the oil and gas company that the lease has terminated. Until you do so, it can be argued that although your lease has expired, or its term has expired, your lease has not been terminated, but still remains in effect. If you have questions about your oil and gas lease, contact us or call (412) 338-1124. ¹ The term of an oil and gas lease is divided into two parts, a primary term and a secondary term. The primary term is usually for a set amount of years, 1, 3, 5, 7 or 10 years. The secondary term normally takes effect once the primary term has expired and the condition(s) set forth in the term clause, or habendum clause, of your oil and gas lease for the secondary term to take effect is satisfied. At that point, your oil and gas lease is extended beyond the primary term into the secondary term and continues as long as the condition(s) for the existence of the secondary term occurs; e.g., “and as much longer as oil and gas are produced,” meaning, in this example, that the secondary term will continue as long as oil and gas are produced. ² Cassell would apply to both oil and gas.